After more than two years as Health Minister in a Government that has failed to tackle key public health issues such as climate change and obesity, Greg Hunt has committed to working more closely with preventative health experts should the Morrison Government be re-elected. As detailed further in the post below, the Public Health Association of Australia (PHAA) has now called on the Federal Opposition to likewise commit to convening a round-table with preventative health experts. The post below wraps other reaction to the Federal Budget, including a warning that the budget is “a nightmare” for young people, while the Social Determinants of Health Alliance says it does nothing to reduce health inequities and that “the people in most need receive the least”. Meanwhile, Reconciliation Australia explains its disappointment with the budget, and the George Institute says key areas crucial to preventing the biggest burdens of disease – chronic disease and injury – remain neglected and underfunded. The Doctors Reform Society says those with significant health care needs seem to be largely ignored or even further punished in this budget, and that “tax cuts can’t replace improved services”. Hunt commits to new dialogue on prevention. Can it be bipartisan? The Public Health Association of Australia welcomes the Health Minister’s commitment that his government, if re-elected, would commit to convening a round table with preventative health experts. At the 4 April post-budget health breakfast in Canberra, Greg Hunt, gave a commitment to engage public health leaders to create a more sustainable health budget. With an election imminent, the PHAA is calling on federal Labor to commit to the same round table, should it form government after May. The budget does nothing to reduce health inequities. The people in most need receive the least in the 2019-20 Federal Budget. Tax cuts will remove vital revenue from the system well into the future. Our ability to pay for essential services such as health care and education will be at risk. 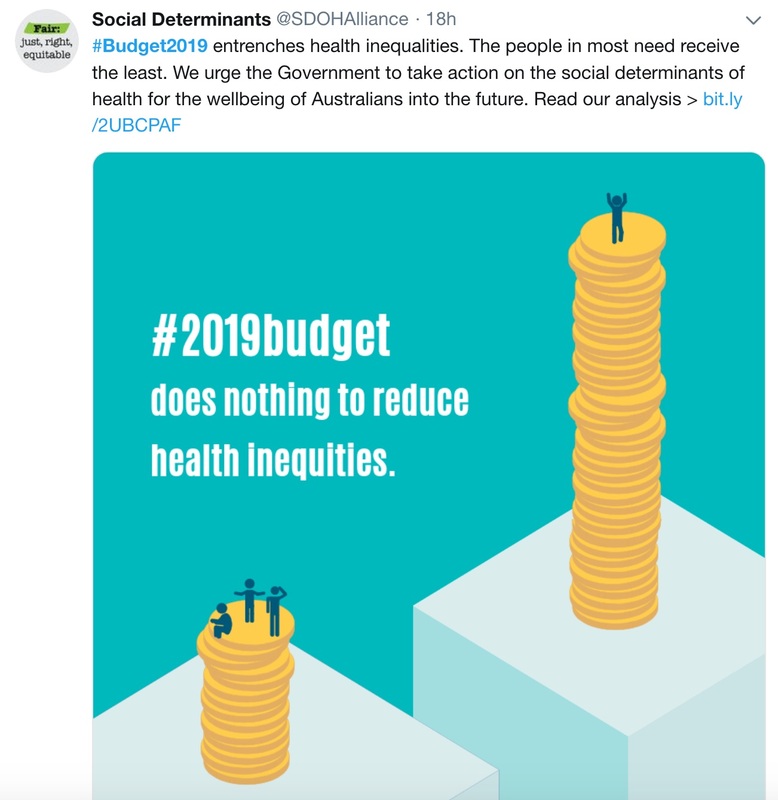 Lack of action now on social determinants of health will have substantial costs on the health and wellbeing of Australians into the future. Our health reflects the environments we live in – our physical, cultural, economic and environmental circumstances. This is the single most important determinant of health. The relationship between income and health is clear – those with lowest incomes have the poorest health. Reducing poverty, addressing racism, stigma and discrimination, ensuring secure and affordable housing for everyone, ensuring health care is accessible to everyone, acting on climate change and improving education and employment will create the environment that promotes good health and reduces health inequities. The 2019-20 Federal Budget fails to address any of these social determinants of health. Tax cuts reduce Australia’s revenue base well into the future. Funding for the essential services the community relies on – health care, schools, child care, age care and disability services – will suffer in the future. Health inequities will worsen. No increase to the woefully inadequate level of Newstart Allowance, despite widespread. support for an urgent increase of $75 per week. No increases to other pensions and benefits. Nothing to respond to or reduce homelessness. Very little investment in social or affordable housing. Biggest benefits flow to those on higher incomes – who have less need for them. People on the lowest incomes – who don’t earn enough income to pay tax – will receive no benefit from the tax cuts. People on $200,000 will get over $224 a week. People on $50,000 will get $23 a week. People on $25,000 (on pensions) get a one-off payment of $75 (equivalent to $1.40pw). People on $15,000 (on Newstart) get a one-off payment of $75 (post Budget announcement). The one-off payment of $75 will do little to offset rapidly increasing costs of living for those on the lowest incomes. No plans to reduce unemployment, particularly for long term unemployed. Limited provisions aimed at the addressing the health disadvantages of living outside major cities. There is $62m to train doctors in rural general practice and money for specific programs in particular regional and rural areas. 15 hours of 4-year-old preschool extended for two years, including $1.4m to increase preschool attendance rates of disadvantaged and Indigenous children. No changes to school education funding. $525.3m over five years to improve the VET system, including up to 80,000 new apprenticeships. However, commentary indicates this is simply returning some investment into the sector that had been cut in recent years. There’s also little joy in public health measures that would improve the health of people on the lowest incomes. Lifting freeze on Medicare rebates for diagnostic imaging and GP services could reduce out of pocket costs. Chief executive, Karen Mundine, said the Prime Minister’s recent closing the gap report outlined the urgent need for further investment. “Governmental support for Aboriginal and Torres Strait Islander services has not met the level of need of First Nation’s peoples,” said Ms Mundine. “The frustration felt by First Nations people and other Australians with the results of the Closing the Gap Framework has been compounded with the lack of any national narrative in this federal budget,” she said. Ms Mundine said this was illustrated by two significant funding decisions outlined in the budget; an insufficient $15 million investment into suicide prevention, despite the ongoing the crisis facing young Aboriginal and Torres Strait Islander young people, and the decision to end the national stand-alone Indigenous Legal Assistance program and roll funding for Aboriginal and Torres Strait Islander legal services into mainstream legal aid programs. Ms Mundine also said there was little in the budget to address the unfinished business of reconciliation and some of the foundational issues that require settlement. “The connection between the material and cultural wellbeing of First Nations people and our national progress towards reconciliation are clear and we are concerned that the stalling of progress towards equity for Aboriginal and Torres Strait Islander people will not be remedied by this budget,” said Ms Mundine. Ms Mundine said concerns about the budget were intensified by the optimism generated by last week’s signing of a partnership agreement between the Government and a Coalition of Aboriginal and Torres Strait Islander Peaks to progress closing the gap. Ms Mundine said the Australia is at a critical juncture in the reconciliation journey with constitutional reform and agreement-making stalled in Parliament notwithstanding strong public support. “These hopes are buoyed by the strong support for such initiatives shown by the Australian public, most recently in the results of our Australian Reconciliation Barometer survey which found that 95% of Australians believe that ‘it is important for Aboriginal and Torres Strait Islander people to have a say in matters that affect them’ and 80% believe it is important to ‘undertake formal truth telling processes’”. “The imminent election provides an opportunity for Government and Opposition to clearly spell out their respective visions for how we this nation can improve the lives of First Nations people and bring us closer to a just, equitable and reconciled Australia,” Ms Mundine said. 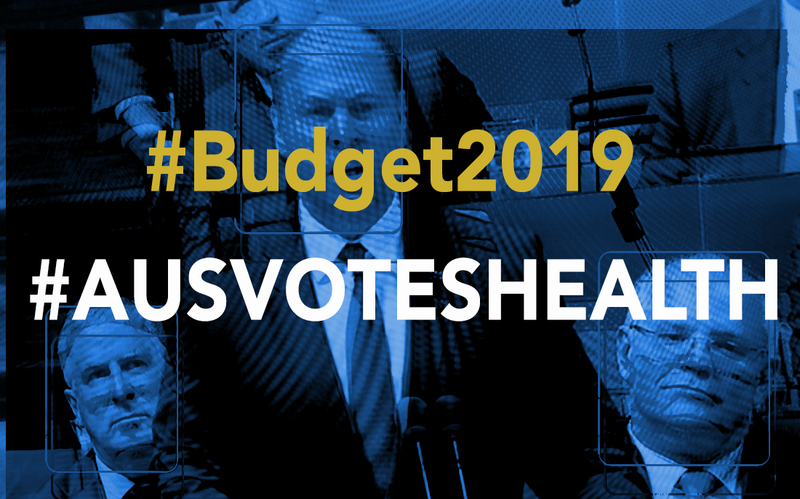 The 2019-20 Federal Budget has been delivered, and while there is much to be positive about in the announcements made to health and research, key areas crucial to preventing the biggest burdens of disease – chronic disease and injury – remain neglected and underfunded. The commitment to long term investment in the Medical Research Future Fund (MRFF) is particularly welcome. This is critical to ensure Australians have access to the best care when they need it, and to allow for researchers to plan ahead as they to look to solve our biggest health challenges. The MRFF, alongside the National Health and Medical Research Council, is smart strategic investment in the future health of our nation, and must be spent wisely. The announcement of a $1 billion investment in primary care, recognises the critical role of primary care in creating a healthier Australia. It also highlights the need for identifying and investing in research, new models of care to prevent and treat complex and chronic conditions, and ensuring Australians in rural and remote settings do not experience disadvantage. The announcement of $737million for mental health is also most welcome. However, there is much more for the Federal government to do to ensure that all Australians benefit from a truly transformative health system that is high quality, accessible and sustainable. It’s imperative that we invest and commit to health equity and prevention measures that will tackle the biggest health crisis facing our time – the burden of chronic disease and injuries, in particular for Aboriginal and Torres Strait Islander people. In Australia, half of all adults have at least one chronic disease, and that number is growing year on year. Many of these conditions are preventable. One in three adults and one in four children are overweight or obese and these rates are on the rise, putting current and future generations at greater future risk of chronic diseases. As such, much more serious investment and commitment to a system-wide and whole-of-government approach to address prevention of chronic diseases and injury, and addressing the inequities facing Aboriginal and Torres Strait Islander people, is a must. It is unacceptable that in Australia, one of the world’s best health care systems, prevention of chronic diseases remain comparatively unaddressed and under-funded, and is a looming national health catastrophe. We are currently spending $27 billion each year on treating chronic disease. We need urgent action, policies and funds to tackle this public health crisis. The Federal budget is an absolute nightmare for young people and our climate. Scott Morrison’s government has given us budget that sets more money aside for a ring road in Cairns than for dealing with climate change – the biggest social and environmental crisis facing our generation. The LNP intends to set aside just $189 million over the next four years to deliver their so-called climate action plan – which, by the way, fails to so much as mention a transition away from coal and gas (aka our biggest contribution to climate change). Meanwhile, $12 BILLION every year is going into subsidies for the fossil fuel industry that’s creating this crisis. It’s beyond outrageous – it’s disgusting and reckless. This is a government putting rich coal, oil and gas companies ahead of the rest of us. Sign our petition to demand an inquiry into the impacts of big fossil fuel donations on our elected leaders and their policies. This kind of budget flies in the face of everything our community is concerned about. It goes to show the toxic stranglehold that big coal and gas companies have over our politics. These companies donated at least $1,277,933 to major political parties last year . It’s time to ask what impact this is having on Australia’s climate policy, or rather, our lack of political action! Sign the petition for an independent inquiry to call out the unfair influence of climate-cooking corporates on our politicians. The Budget “seemed to forget that as doctors we see daily the challenges to access adequate timely high quality health care for many of our patients”, said Dr Tim Woodruff, President, Doctors Reform Society. No mention was made of ways to address the 8% of hospital admissions which could be prevented with better GP and community care (largely funded by the Federal Government). Forgotten also was the inadequate access to proper care in nursing homes because of lack of staff and access to GPs, leading to unnecessary admissions to under-resourced public hospitals. No mention was made of the years on elective surgery waiting lists for relatively simple procedures which might return a low paid worker to productive work but for the inadequate Federal funding of both primary community care and public hospitals. Dental care wasn’t even mentioned despite the fact that dental procedures in public hospitals are the second most common reason for preventable hospital admission. All such patients need is adequate community dental care. It doesn’t happen. Waiting list for dental care extend to years and it doesn’t rate a mention. The Government has nothing to offer regarding the promotion of teeth rotting food and beverage. What will the Government do for our toothless patients? The boast is that there are less people on welfare. Welfare recipients struggle with health issues. We already have the most highly targeted welfare scheme in the OECD. It punishes deserving people and adds to their poor health. We see patients struggling with welfare issues far too often, with poor co-ordination with support services. Unemployable patients are given an unemployment benefit 40% below the poverty line. Whilst it’s great that people are encouraged to work if they can, many of our patients struggle. Robo-debt strategies make them sicker. The budget indicates further savings via supposedly even more efficient systems and if past performance is an indicator, even harsher treatment of welfare recipients. It is disappointing that those with significant health care needs seem to be largely ignored or even further punished in this budget. Tax cuts can’t replace improved services. Maree McCabe, Dementia Australia CEO said the initiatives in the 2019 Federal Budget are a good start but they do not speak to the heart of the problem for people living with dementia, their families and carers – the need for recognition of dementia within the health, ageing and disability industry. “Dementia Australia’s Strategic Direction, Designing a New Future, released in October 2018, showed that the issues important to people impacted by dementia are timely diagnosis and support, the need for quality dementia care and tackling discrimination,” Ms McCabe said. “With 447,000 Australians living with dementia, 1.5 million people involved in the care of someone living with dementia and the prevalence projected to increase to 1.1 million people by 2058, the impact of dementia cannot be ignored. “Dementia is the chronic health condition of the 21st century. “Dementia needs to be core business for everyone and there is still a lot more to do in health, disability and ageing. “A comprehensive and coordinated action plan is required to specifically address the complex needs of people living with dementia and, their families and carers, 70 per cent of whom live in the community. “This figure particularly highlights the urgent need to respond to the growing waiting list for Home Care Packages. “Dementia is the second leading cause of death of Australians and the leading cause of death of Australian women. “I urge all parties in the 2019 Federal election campaign to pledge to include significant investment in dementia care. Strategies to support the struggling regions appear to be largely driven by infrastructure big spends – which notoriously have minimal impacts on women’s employment and development opportunities. The droughts, fires and floods are not to be addressed by significant programs to mitigate human influences on climate change – notwithstanding the demonstrable needs in the regions, let alone recognition of how innovative strategies could reduce the impacts of climate change on human health – a point which the public health community is making strongly. We point out how women, especially vulnerable women, can be especially at risk from the impacts of climate change. Social Services is planning yet another massive ‘savings exercise’ in automation of payment systems, as well as anticipating a fall in Age Pension payments as the retirement age is pushed to 67. Already many women over 50 are languishing in housing stress on the disgracefully inadequate Newstart – and of course there are no new investments in housing programs. We can anticipate more early middle-aged unemployed women going onto Newstart as work opportunities for them fail to match their inevitable ageing. We find issues in re-announced measures for the National Strategy on Violence Against Women. These are set out in that paper (see here). See more NFAW reports providing a Gender Lens on the Budget 2019-20. • Also see our previous post compiling #Budget2019 responses from more than 30 organisations, and this one from Aboriginal and Torres Strait Island organisations.